Felicity Interiors is able to manufacture and combine different materials into beautiful bespoke furniture pieces. Felicity Interiors specializes in high-quality custom cabinetry and interior design expertise for residential homes in London. Our detail-oriented team strives to provide exceptional quality products and design solutions tailored to the needs of our clients. We understand that designing your home can be complicated, so we are here to help you make the selections that best suit your style and needs. We offer interior design expertise and are able to produce anything from high-end bespoke kitchens to large wardrobes shelving units. Founded by husband & wife, Alina and Antanas, A&A Bespoke Furniture design, manufacture, install handcrafted kitchens, bespoke wardrobes, as well as a variety of other bespoke furniture made for all rooms of the house. Whether you prefer the traditional country style or desire something more contemporary, A&A Bespoke Furniture specialists will work with you to ensure that the finished room is everything you dreamed of. As a team of highly skilled cabinet makers we can provide a wide range of bespoke fitted furniture products such as built-in or walk-in wardrobes, sliding door wardrobes, cupboards, cabinets and shelves, individual bookcases or entire libraries, office and home office furniture, bathroom furniture, storage cupboards and chests of drawers, etc. Our large range of products spans from living room to bedroom furniture and from customised office to reception solutions. Ian Dunn Woodwork & Design was established since 1981 by Ian Dunn. We have over 30 years of experience in designing and producing both traditional and modern furniture. We love kitchens – they are the hub of the modern home with areas to cook, eat, relax, socialise and such an important part of the home to get right! Our experienced team know how to interpret and realise your dream interiors, every project is unique and we love a challenge! We specialise in bespoke cabinetry with a team of highly skilled craftsmen and designers have an exceptional eye for detail, building a range of domestic and commercial furniture, from kitchens and bathrooms to fitted and freestanding furniture. Our cabinetry range from traditional to contemporary, whilst also producing designs to compliment existing property features. We ensure each project is managed impeccably from start to finish with our designers. We work closely with architects, interior designers, builders and clients assisting and suggesting a wide range of fittings and finishes. We pride ourselves in using timber from responsible suppliers with FSC, PEFC or SFI certifications, thus minimising our carbon footprint. At Smart Fit Furniture, we know that space can be precious. We provide custom-made furniture, wardrobes and storage solutions to maximise your space, so you can get the most out of your home. Each piece of furniture is tailored to our clients’ needs and budget, then will be delivered and installed by our outstanding team of specialists. We work closely with you throughout the entire design process to ensure that each piece of furniture is created with functionality and personality. Covering all of Greater London - our team is committed to completing all projects professionally and within the highest standard. If you’d like to receive a free estimate, give us a call today! 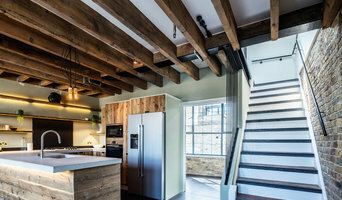 "At Brandler London, we design and fabricate bespoke made cabinetry, joinery and furniture using our inhouse supplies of reclaimed barn wood with a focus on bringing out its inherent beauty and enhancing the naturally textured finishes. The effect of our work results in dramatic spaces that are not only practical but also permeate a natural warmth and timeless aesthetic. In addition we offer other biophilic material finishes such as natural barks, charred wood (Shou Sugi Ban), pressed meadow grasses with flowers, pressed seed pods, moss, etc. Working closely with our Clients, we design to ecological, environmental and sustainable standards and this is reflected in the natural beauty of our end products. Brandler London also work with steel and concrete, which is used to enhance the natural finish of the items that we fabricate, as well as more standard materials including veneers, hardwoods, laminates, MDF, Plywood, etc. Chris Brandler and his team are passionate about their work and pay a great deal of attention to the Clients and their requirements, ensuring that they are very happy with the end result." Fitted Lifestyles is a luxury bespoke furniture company based in London. We specialise in the design, manufacture and installation of commissioned furniture. 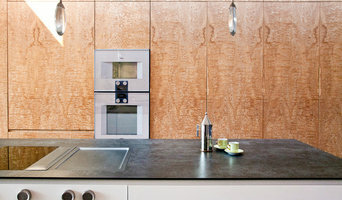 Using a wide range of natural or manmade materials and finishes coupled with contemporary and traditional woodworking techniques we ensure that every client’s taste can be catered for. We work mainly for private clients in Surrey and South West London. We also undertake work for interior designers, builders and architects. All of the furniture we make is completely bespoke ensuring we make the best use of available space and is tailored to client’s requirements and personal style. As specialists in bespoke furniture, we are not restricted in design by using pre-made components such as doors or carcasses. Instead we measure a space, discuss your initial requirements and liaise closely to turn these into beautiful and practical designs that are specific to your needs. Then we make and fit the pieces ourselves, minimising any disruption in your home. We are a small company that thrives on client satisfaction. Our attention to detail and high quality workmanship is our main goal as most of our work is repeat business from client recommendations. Taking pride in offering a friendly, personal approach we immerse ourselves fully in each project, no matter how large or small, to produce beautiful, functional furniture that will stand the test of time and exceed your expectations. Woodsmith was established in 2015 by Duncan Crockford, a joiner with 15 years of carpentry experience across London and the South-East. Duncan is passionate about quality and helping people efficiently maximise their space. We design, build and install bespoke residential furniture and kitchens to London-based clients who demand a high-end finish with the utmost care and attention to detail. From 3D visualisations to design, build and installation, Woodsmith takes a collaborative approach with each of our clients, ensuring the best outcome for the space. Woodsmith use sustainably sourced wood, and high quality fixtures and fittings. Philip Clay Design operates on a foundation of passion for design and the art of making, established by husband and wife team Philip and Keighley, a couple whose roots are both anchored in creative design. With Keighley’s background and training in fashion print and Philip’s experience in furniture making after having studied fine craft, the collaboration resulted in the creation of exquisite bespoke kitchens, cabinetry, and free-standing furniture. The company has grown organically, from humble beginnings in Philip’s garage to the inspiring company it is today, as a result of the lasting quality and unique design that characterises our products. We are inspired by the transformation of spaces and seeing ideas come to life, so our furniture and kitchen designs stem from a true passion and respect for the craft. Balau Kitchens is a well respected family run kitchen studio in Hackney specialising in bespoke kitchen, bedroom and study furniture. We have been designing and installing bespoke kitchens and other cabinetry for 18 years and we supply to all London areas. There is no brochure – each project is unique, designed and managed around you, the client, to suit your style and preferences, as well as meeting all architectural demands. Each kitchen we create is as unique and individual as you are. The vision is yours, but made real by us with passion and expertise – streamlined and polished to make your dream come true. We welcome the opportunity to be part of one of the most important projects you undertake. Each kitchen is an investment for 20 years and we are fully committed to meticulously plan each detail to your complete satisfaction, as we understand the importance of your investment and the trust you place in us. ……and so, after five years of sharing workshop space, problem solving each others projects and spending lunchtimes chatting about how great it would be to work together, we finally took the plunge and in the summer of 2010 Constructive and Co was born. We are Sam Scott, Tim Greany and Dom Shanks, all cabinet makers who have built up our own successful companies designing and making furniture. Having collaborated at various times over the years, it became obvious that working together was the way forward. We cover a full range of bespoke furniture projects from Handcrafted fitted kitchens to free standing pieces. We like to be set a challenge, and will always welcome collaborations with adventurous clients, designers and architects. We like it when we get the chance to broaden our horizons with new materials, shapes, ideas and applications, but whatever your requirements, we’ll do our best to find the right solution for you. Our workshop is located in Leyton in east London and clients are welcome to come and visit us to discuss their projects and go through the processes involved. Feel free to get in touch for more information. Creative Woodwork's bold, simple designs are manufactured to the highest quality in west London and installed with care to give some of the capital's most beautiful homes the personal touch that can only come from bespoke furniture. Our projects can be as simple as a carefully judged alcove unit or fitted wardrobe, to attic-to-cellar refits including bathrooms, bedrooms and living and dining rooms. We're also specialists in media units, storage solutions and home office space. Elite Carpentry Services has built a reputation as one of the finest fitters of high-end and bespoke furniture in its field. Boasting a unique Full-Service offering, the team at Elite' share a passion for quality, perfection and client satisfaction. This passion for woodwork is defined by Elite’s underlying belief: ‘Creating Character in Wood’. Since Elite first started operating in 2014 the business has grown from a single residential workshop to now 3 fully resourced locations in Sandhurst (Berkshire) and Woking (Surrey). These ideal locations allow Elite to provide its services to Commercial and Domestic customers throughout southern England. Elite Carpentry Services has built a strong reputation. The team at Elite to provide a ‘full service’ for the bespoke furniture market. From design to installation, Elite accepts nothing but the best. Recognised for the quality of its finished work, the attention to detail and outstanding customer service, Elite exceeds the highest expectations. Jacob Alexander create bespoke handcrafted kitchens and furniture. Operating from our office and workshop in Peckham, South London, we are a small diverse team dedicated to producing exceptional quality cabinetry, innovative finishes and lasting design. Whether using raw natural materials or refined factory-applied finishes, employing quintessential styles or introducing new uncommon combinations – we encourage a dynamic interaction of materials, disciplines, technology and craft. Neatsmith is a family owned and run, London Based wardrobe and storage business, specialising in Hinged, Sliding and Walk-In Wardrobes. We prioritise innovative design, quality and service. We have five showrooms currently in: Brentwood, Chelsea, Finchley Road, Hatch End and Teddington. Our bespoke wardrobes are designed and crafted at exacting standards by hand, in our North London factory, setting us apart from other wardrobes on the market today. Accompanying your wardrobe, a fully-lined internal carcass will be designed especially for you. "We're dedicated to working on a very personal level with our clients to produce something of real quality which we feel proud to say is by Neatsmith" Andrew Nagel, Director. Contact or visit us today in showroom to discuss your plans and let our design team help create your perfect storage solution. Unless you are after a completely exposed look, cabinets and cupboards will be staple pieces of furniture in your home. While most people turn to furniture shops or showrooms, if you want a more unique look for your cabinetry in your kitchen, bathroom or elsewhere in the house, then hiring cabinet makers in Uxbridge, Greater London through Houzz could be your answer. Why should I hire an Uxbridge, Greater London cabinet maker? Cabinet makers are skilled craftsmen who can design, make, rework and repair cabinets and cupboards. They can create bespoke storage or kitchen units for your home that meet your needs and fit with your interiors. They can also advise you on materials and cabinetry styles if you’re not completely sure on the design yet. With the right bespoke cabinet makers in Uxbridge, Greater London, no cabinetry job is too difficult, so even if you have a tricky corner space that you want to utilise, an Uxbridge, Greater London cabinet maker can create a cupboard to your specifications. Bespoke cabinet makers are more than just bathroom or kitchen cabinet manufacturers and they can be commissioned to create storage cabinetry around the home. Bespoke TV cabinets are in popular demand due to the variations of TVs, consoles, digital TV boxes, DVD players and other items that we want to keep near to our televisions. Skilled cabinet makers in Uxbridge, Greater London can create a one-of-a-kind TV cabinet or media centre to house all your entertainment goodies. If you already have cabinets or cupboards that you’d like to keep, but they’re just in dire need of a facelift, then bespoke cabinet makers may be able to help, too. You may wish to replace kitchen cabinet doors, give your cupboards a new colour, add decorative elements or use a special finish; whatever the cabinetry task, ask cabinet makers in Uxbridge, Greater London if they can help you. If you need the help of a cabinetry professional when renovating a home, make sure they are happy to work with any other professionals working on the project. Here are some related professionals and vendors to complement the work of cabinet makers: Kitchen & Bathroom Designers, Kitchen & Bathroom Fitters, Interior Designers, Home Storage Designers & Professional Organisers, Carpenters & Joiners. How long have you been cabinet makers in Uxbridge, Greater London? Are you bespoke cabinet makers or do you work with set designs? May I see more examples of previous work? How much do you charge for your cabinets, and what does that include? Will you choose the cabinetry materials, hinges and handles or should I? Do you offer cabinet repairs or restoration? Will you come and take measurements? Do you offer a warranty on your cabinets? When can you complete the job? Will I need to provide you with anything? Find a cabinet maker on Houzz. Narrow your search in the Professionals section of the website to Uxbridge, Greater London bespoke cabinet makers and cabinetry. You may also look through Uxbridge, Greater London photos to find examples of cabinets that you like, then contact the cabinet makers in Uxbridge, Greater London who worked on them.